This setting determines the scale used when using the scale graded type. The scale for an activity-based graded item is set on the activity settings page. 1. Login to Moodle, and open the desired course. 2. 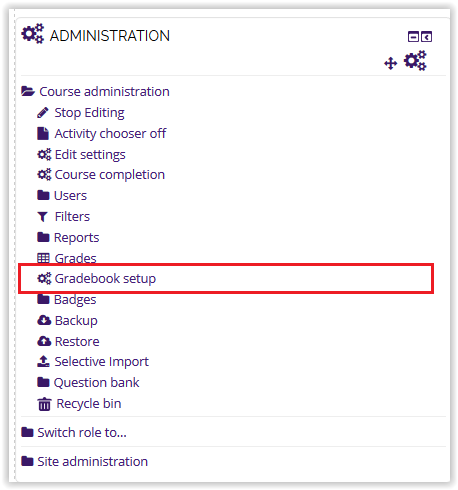 Select Course Administration | Gradebook Setup from the Administration block. 3. The Gradebook Setup window should appear. Locate your graded item, and select Edit | Edit Settings in the Action column. 4. Change the Grade Type to Scale under the Graded Item menu. 5. Next change the Scale to one of the options in the drop down menu. 6. Click Save Changes when finished.